I made this for Jasmines lunch the other day, was quick and tasty and such a great finger food for babies. For the crepes, I mixed all purpose flour with 2 eggs and milk until I got a nice batter. 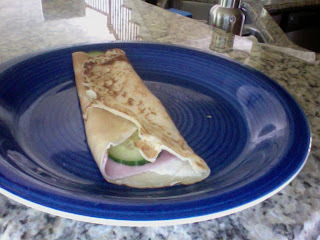 Then I made the crepes, added ham, cheese (laughing cow- love it!) and cucumber. She happily munched away on it with her 3 little teeth!, then afterwards, she had one with blueberries and nutella. so sweet of her, I love her blog and her style of writing is so witty, check it out you won't be disappointed. There were no rules to pass it along but I can't resist, as I keep coming across blogs that deserve awards! Talita of http://echocorango.blogspot.com/ when you see her cakes you'll know why!! Rebecca, thank you so much for the award! I will be sure to pass it on! I feel so honored. Congrats on the award! Thanks for passing it on to me! 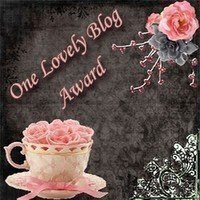 Hello Rebecca, thank you so very much for the award, this is so sweet of you and I am honoured. I am gonna pass this wonderful award on, stay tuned, haha. Congratulations on the Award! My kids will love this recipe. Laughing Cow is the best--so great to have around. Congrats on the award too! Congrats on the award. They are so much fun. Congratulations on your award. 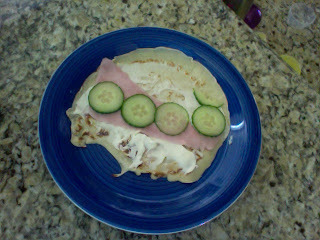 I really like the ham an cheese crepe with the cucumber on it. What a great idea. I bet the Laughing Cow cheese melted well because it's so nice and soft. Nothing beats ham and cheese crepe. This is a comfort food. How nice of you! Thanks for the award love and congrats to you for receiving it. I love crepes. That is one thing I can get here in Brazil and many places do them quite well. My favorite is filled with sundried tomatoes and arugula. I've never tried making them myself though. Yours look great! Delicious crepes!! Congrats on your award! You deserve it! You are a love! Thank you so very much for the award and your kind words. It's wonderful. Hi, Rebecca! Thank you for this caress! I love crepes, and those look so yummy!! Rebecca, congratulations again! ha ha. I'll check out the blogs later. Your little sweetie pie can really eat, probably her favourite! I love the crepes - especially the nutella one - yumm!! Congrats on another award - you deserve them! Your so sweet - thanks for the kind words and passing another one on to me. I am going to have to get to work on a big award post. Your crepes look great! I was just thinking about how I should try my hand crepes one of these days. Congrats! ham and cheese crepe is really great..
Oh the crepes sound delish!